1200vac dry capacitors - Anhui Safe Electronics Co.,LTD. The capacitor is made of low loss metallized polypropylene film, the self-healing film is the use of imported base film, the application of patented technology evaporation of the gradient side of the safety film. Film with fully automated equipment rolled into a cylindrical, the application of non-sense winding technology, the core of the internal use of thin copper connection technology, making the capacitor production inductance smaller, over-current over-voltage ability. According to the long-term use and test results verify that our capacitor dielectric has a very self-healing. We use the thickening of the edge of the film in the form of increasing the edge of the contact area, so that the film contact with the spray surface of the gold part of the better, increase the product over-current capacity and reduce the edge stress. 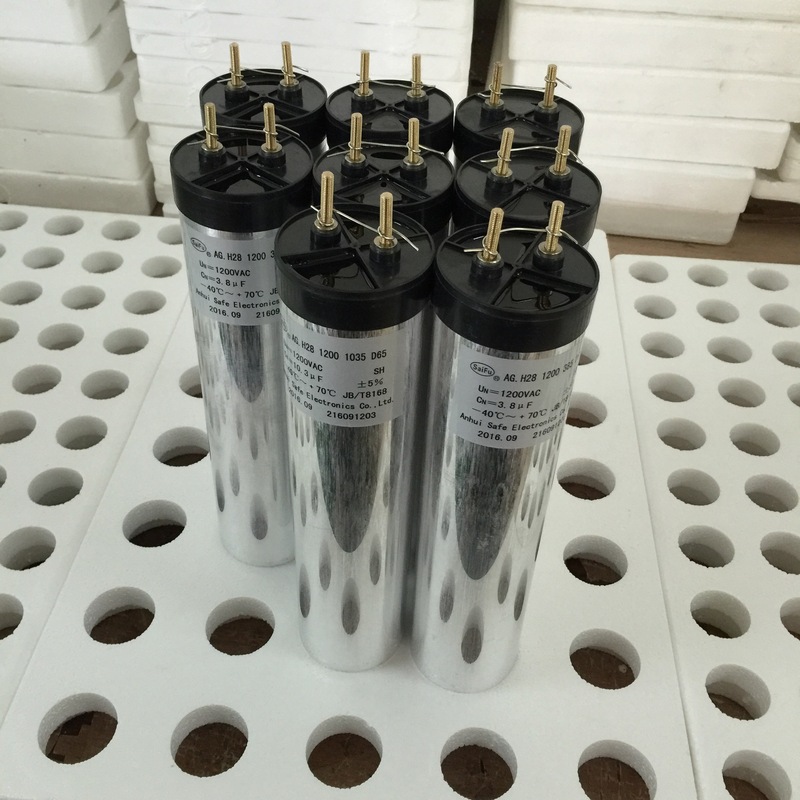 The medium filled in the capacitor is to isolate the air between the electrodes, without the protection of the media, the metal coating will be oxidized, the metallized film will be more and more self-healing, the capacitance of the capacitor is getting smaller and smaller .Therefore, when we put the capacitor into the aluminum case with polyurethane for perfusion, the need for vacuum drying of the capacitor to protect the wound core and its surrounding environment, making the capacitor in the long-term use when the capacity is very stable. The capacitor is filled with polyurethane, so the capacitor has a very high volume utilization ratio, very good self-healing characteristics and over-voltage automatic protection characteristics, when the operation of the accident or the capacitor overload, the capacitor will automatically disconnect to ensure safty operation.